Kellogg Community College’s youth robotics competition team, the Bruin Bots, finished as runners-up at the FIRST Tech Challenge State Qualifier Tournament held Nov. 22 and 23 in Canton. The team also was one of three finalists for the Connect Award, which recognizes team efforts related to connecting with their community and the engineering community at large. Kim Andrews-Bingham, Bruin Bots coordinator and training coordinator for KCC’s Workforce Solutions Department, said the team impressed the judges, stepping up and showing they are becoming great leaders as well as great engineers. The FTC tournament – one of six qualifying tournaments held statewide to determine finalists for the state competition – included 21 teams which created and controlled robots to compete with other teams to complete various tasks. These included projects like picking up blocks and putting them in specific locations, raising a flag and having the robot pick itself up chin-up style on a horizontal bar. Sanye Sichinga, an 11-year-old Bruin Bots participant and seventh grader from Springfield Middle School, said it was “kind of a heartbreaker” to lose in the final match, but that the team persevered through the disappointment. Robb Cohoon, the Bruin Bots’ head coach and an adjunct instructor at KCC, said he’s seen the kids in the program grow since the season began in September and that the experience will help launch them toward great things in the future. 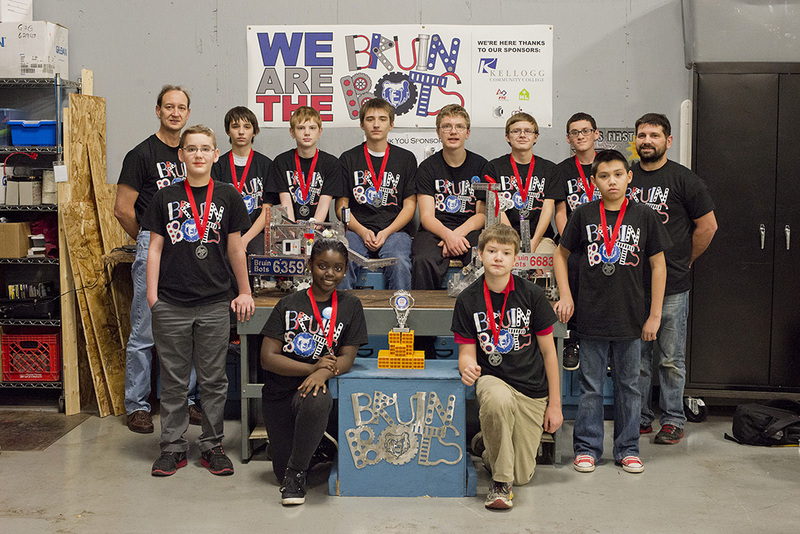 This fall marked the second season of Bruin Bots programming at KCC. The team includes sixth through ninth graders from Calhoun County who together build and program competition robots as part of the College’s Regional Manufacturing Technology Center (RMTC) programming. For more information about the Bruin Bots or to hear about related youth robotics programming coming to the RMTC this spring, contact Andrews-Bingham at 269-565-2802.